Nancy Pelosi left her poker face at home last night. President Trump’s State of the Union address last night was pretty decent. Yes, it was overblown. He succumbed to the usual temptation to list one initiative after the other he wants to accomplish, a litany that makes one weary at the 61st minute, and Trump went on close to 80 minutes. I was struck, though, by some good, some bad, and some ugly elements of the evening. 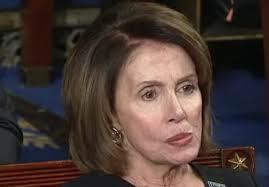 The ugly is obvious: Nancy Pelosi. I’m not talking her appearance, but rather her demeanor, which was barely disguised loathing for our president. She and her party refused to clap for some very positive things the president had to say which bodes well for working class America. Their classlessness reflects their party well. Detractors of Mr. Trump will quickly point out his classlessness, to which I offer no counter-argument. The bad, it seems to me, was Trump’s need to throw barbs at the “other guys.” This seems as being counter-productive when you want to cut deals with these same people. Even more, Trump is following Obama’s lead with his polarizing rhetoric. Obama made it clear he wasn’t president to everyone. He weaponized the federal government to hurt pro lifers, Little Nuns of the Poor, and conservatives. Trump is in payback mode. Too many Americans in protected liberal classes don’t feel he cares about them. I was also struck by his total avoidance of any discussion of deficits. In fact, he is calling for a $1.5 Trillion infrastructure package AND to rebuild our military WHILE coming off of significant legislation that cut taxes significantly. Deficits are a big deal. Is he going to punt on this issue? Apparently. The risks are high as growing interest payments on the debt crowd out other spending. Now for the good. President showcased some awesome Americans. A twelve year old boy who is responsible for placing 40,000 flags on the graves of soldiers. A cop who adopted the child of a heroin addict. A refugee from North Korea who held his crutches high, not to give the finger to an evil dictatorship, but to shine a light on his unfathomable gratitude to live in this land of the free. Thank-you, President Trump, for allowing us to glimpse the character of real Americans. I love these people. At least Pelosi is consistent… her interior perfectly reflects her exterior. True, I have not enjoyed the glimpse she has given us into her interior. If she becomes Majority Leader again, America is in for another rocky ride.